Are you married? Do you love your spouse? Do you have children? Do you love them? You have parents? Do you love them? What about brothers and sisters? How do you prove you love those closest to you? Providing for them is one way. Let me give you a simple but very revealing test of the quality of your love. When was the last time you went to see your GP? I don’t mean because you were sick. When was the last time you saw your GP for a health check? You know, blood pressure, weight, cholesterol, kidney function, glucose, PSA, etc. Its free so, no excuse. Assuming you have visited your GP recently, do you have an annual health checkup? Do you know the date of your last one? And your next one? Is it in your diary? You service your car. Which is more important? And assuming your GP has prescribed some medication to assist with cholesterol or high blood pressure, do you take them daily? If you really love those closest to you, I suggest it is more important having an annual health check highlighted in your diary than remembering their birthdays or your wedding anniversary. It shows you care more about their future than about your past. Proving you love those closest to you may mean making a phone call tomorrow morning. But before you do, lets explore how the Apostle Paul understood the need for a health check, a spiritual health check-up for himself and the church in Colossae. Our Burden: Contending for the Church of Jesus Christ. Our Goal: Growing in the Wisdom of Jesus Christ. Our Delight: Security in the Faith of Jesus Christ. I wonder if you have ever aspired to become a pastor or evangelist? Most young believers do at some time or another. We are enthusiastic and thankful to Jesus and we want to serve him. We feel like giving up everything to become a missionary or pastor. If that is you right now, if the Lord is asking you, then please come and talk to me. If you are not sure but open, our apprentice scheme is designed to help test a call to ministry. We are seeking two or maybe three right now to start by the Summer. Paul writes about his struggles on behalf of the churches in Colossae and Laodicea. As we know from his other letters he was burdened by the needs of other churches too, spread right across Greece, Turkey and Syria, but he does not mention them here. Without mobile phones, email, Skype, Facebook and Twitter, it would have been much harder for the Apostle to stay in touch with his friends and family. This inevitably led to occasional misunderstandings and frustrations. On occasions, as is implied here in Colossians 2, there were false assumptions or unrealistic expectations. Paul uses a strong word to describe his work on their behalf – ‘contending’. It is the same word used to describe the stress of an athlete in a race or competition. It speaks of his deep commitment, his dedication. It sounds like they felt neglected or uninformed. They were in danger of being deceived by pastors who had another agenda. Where was Paul? What was he doing? When he writes in verse 4, “I tell you this so that no one may deceive you by fine-sounding arguments” (Colossians 2:4), it suggests they were in danger of being deceived by false teaching. Which is why Paul emphasizes “For though I am absent from you in body, I am present with you in spirit.” (Colossians 2:5). Paul was an itinerant evangelist, a church planter, a writer, and pastor teacher. At times he stayed in the same place for several years. At other times he was constantly on the move planting churches. Every pastor is different, just as every church family is unique. And here lies the tension between roles and expectations. Even though they had never met Paul, he wanted them to know how hard he was working on their behalf. He says, “I want you to know how hard I am contending for you.” And I want you to know, that I am contending for you too, even when I am away. As you know in 2015, I took a year’s sabbatical from international ministry. In January this year I visited Cairo to give some bible teaching and preach. I will be returning in July and again in August. We are also planning to launch CE in the DRC in September. On the back wall there is a summary of my international ministry over the last 40 years. Some of this is public and you can read about or watch videos about these projects on my website. But some is below the radar in countries where the church is persecuted. To paraphrase Paul, “Whether I am absent from you in body or not, I am present with you in spirit and also usually accessible 24/7 by mobile phone, skype or email.” And like Paul, “I want you to know how hard I am contending for you.” The Burden of Ministry: Contending for the Church of Jesus Christ. Three observations take us to the core of being a Christian. The gospel is not a secret but it is a mystery. The gospel, the good news of the saving work of Jesus is there for those with eyes to see, from the very beginning of God’s revelation in Scripture. As we saw in our recent sermon series “Christ in all the Scriptures”, the person and work of Jesus Christ is revealed in every book of the Bible. In Scripture history, we find God progressively revealing more and more about the Lord Jesus Christ, the Son of God, King of the Jews and Saviour of the world. This was certainly Jesus own understanding of the purpose of Scripture. There is no substitute for the reading of Scripture every day. Jesus answered the devil, “It is written: ‘Man shall not live on bread alone, but on every word that comes from the mouth of God.” (Matthew 4:4). We should read the Bible until we see the smiling face of Jesus on every page. For until we do, we have not understood it as God intends for the Bible is His story. The knowledge of Jesus is our priority. Our goal is not simply to have read the whole Bible, or even to read it once a year. That is a good priority but it is not our goal. Paul’s goal was their encouragement and unity in Jesus. The expression he uses is the idea of being knit together in love. He clearly imagines a strong bond between these believers, even though he has not met them. His goal is their growth. And their growth will come as they understand more of Jesus and God’s will for them. Paul was rejoicing because of two things: Their discipline and their stability in the face of opposition. Paul was saying “I’m so glad you are hanging in there.” He wasn’t advocating a new liturgy or a slick organisation structure. He is using military terms. In their ‘discipline’ they resembled an army. Their common dedication to Jesus made them like a compact military unit. The word ‘discipline’ means holding position, serving in their appointed place, together as a team. Earlier I challenged you to think about how having an annual health check shows you care about those closest to you. Well, starting today, we want to show we care about your spiritual health in the same way. 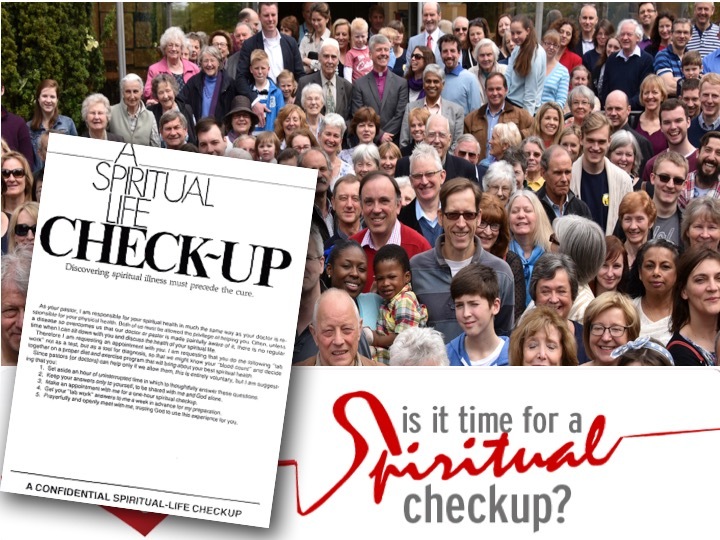 You should have received a copy of the Spiritual Life Check-up[i]. We look forward to meeting up with you soon. Please phone to make an appointment. Because as we have seen from Colossians, Our Burden: Contending for the Church of Jesus Christ. Our Goal: Growing in the Wisdom of Jesus Christ. Our Delight: Security in the Faith of Jesus Christ. Lets pray. This entry was posted in Anglicanism, Bible, Christ Church, Sermons, Theology on April 21, 2016 by Stephen Sizer.